Reported Rangers target Craig Bryson impressed as he played the full 120 minutes for Derby County in their FA Cup third round replay win against Southampton at St Mary’s on Wednesday night, and Steven Gerrard’s chances of bringing the 32-year-old to Ibrox have surely become more difficult as a result. The Daily Record reported earlier this month that the Liverpool legend is keen to bring the 5ft 7in Scot north of the border despite the fact that he has got plenty of appearances under his belt for the Championship club this season. His outing on the south coast was his 22nd of the campaign under Frank Lampard, and he is certainly still looking to prove to his manager that he should be a regular in the XI having been in and out of the side in recent months. 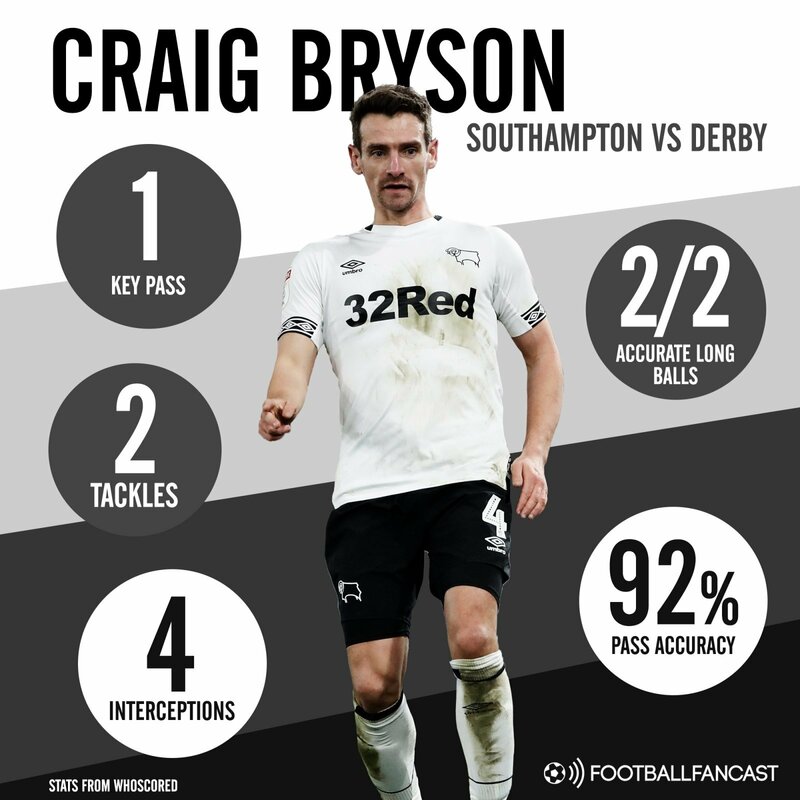 Bryson has now made three successive starts having been an unused substitute against Sheffield United, Norwich City and Middlesbrough across the festive period, and he has certainly done his chances of remaining at the Pride Park Stadium after January 31 no harm at all following a standout display against Ralph Hasenhuttl’s men. The three-cap Scotland international was visibly one of the best players on the pitch against Premier League opposition, and he was unlucky not to get on the score-sheet was when his neat finish was eventually ruled out by VAR for a marginal offside in the build-up. Aside from that, he had a passing accuracy of just under 93% – including one key pass – won two aerial duels despite not being the biggest on the pitch, and showed his defensive abilities in a central role by winning two tackles as well as making three interceptions and one clearance, as per WhoScored. His high work-rate certainly won’t have gone unnoticed by Lampard as he swept up in key areas, and he proved that he still has a big role to play for the Championship promotion hopefuls in the remainder of the 2018/19 season, when his contract is due to expire. Meanwhile, the Derby manager’s former England teammate was clearly hoping to add Bryson’s quality and experience to his midfield alongside other key players like Steven Davis and Scott Arfield, but convincing the Rams to sell now will surely now be a lot more difficult, as they may choose to keep him until the summer.